As embedded devices become more complex and more software is included, boot times increase. But this doesn’t have to be true in your devices. 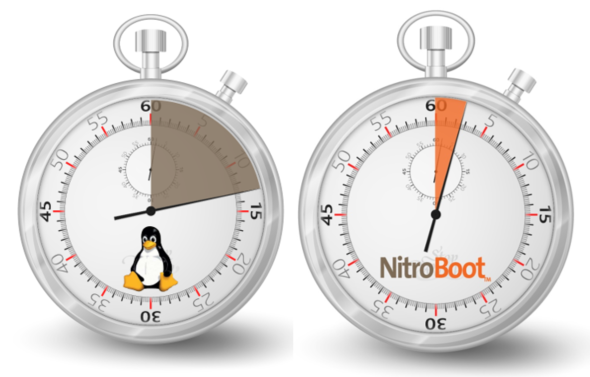 NitroBoot can wake devices up nearly instantaneously, enabling full functionality right away. With NitroBoot, manufacturers can develop automotive in-vehicle infotainment systems, mobile devices and digital home electronics that can be instantly launched from zero standby power. This is accomplished by preferentially restoring the memory areas necessary for booting the system. This technology helps device manufacturers produce unforgettable user experiences and distinguish themselves from the competition. Suspend-to-disk (hibernation mode) where boot time increases as memory size grows. NitroBoot combines hibernation with proprietary technology to overcome challenges inherent with hibernation. The NitroBoot core learns about the system and prioritizes what gets restored when. It takes a Snapshot of the RAM of the running system and then moves the critical pieces back into RAM in priority order. NitroBoot supports 32 and 64bit single core and multi-core ARM processors (ARM9, ARM11 and Cortex-A) running Linux kernel versions 2.6.26+, 3.x and 4.x including Android 4.x and 5.x. Secure Boot processes can be used to verify NitroBoot, while verification of the Snapshot Image can be handled within NitroBoot to provide robust security alongside dramatically shortened boot times. The optimization tools provided with the NitroBoot SDK allow customization of the Snapshot Image. Developers can provide a seamless user experience by adjusting NitroBoot behaviour including supporting compression of the Snapshot Image. Customize your design by implementing threads which run concurrently with NitroBoot. Now you can update the display, play audio or control the CAN bus while utilizing NitroBoot to bring up the rest of the system. NitroBoot supports NAND flash, ROM, SATA disk, eMMC and SD card for the storing the snapshot image. The latest eMMC and SD standards, including HS200/HS400 and UHS-I high speed modes can deliver the fast boot times that customers expect from devices. For increased reliability and minimal device mount times, the storage media can be partnered with the Reliance Nitro file system. To find out more about reducing the boot time of your Linux and Android based devices please complete the form below.